Five years after its launching date, the Diam 24 One Design has not finished to surprise us with the creation of the Diam World Tour. This new circuit – 3 events today, has been made possible by the international success of this 24 feet one-design boat (7,3 metres). The official boat since 2015 for the Tour Voile, it has seduced a wider range of public and the count of 100 units on the market will be overtopped in the coming months. Spectacular but nonetheless fun, accessible and a strict one-design, the Diam 24 od has got today lots of supporters in different countries and high-levels regattas take place on three continents. In February, eight teams have joined the warm coasts of the Middle East to compete in the new formulae raids of the Sailing Arabia The Tour (SATT) at Oman. This World Diam Tour first race has been followed by the king event of this World Tour, the Tour Voile, which has triggered more participants. The racing season has finished on the polynesian waters with the Grand Prix Pacifique des Jeux (Tahiti), crowned by a 5 000 euros* money prize. The local skipper Teva Plichard, who came up second last year in the Tour Voile on his Diam Trésors de Tahiti is one of the initiators of this event. « It’s an interesting idea as it will boost the class and raise the level. It will also encourage foreign skippers to come» he explained. The Swiss born Bernard Stamm (Cheminées Poujoulat) has been the first to sign up in these different events in order to « sail in different parts of the world » and also to spend as much time as possible on water, hence gaining in competitivity level. The Diam World Tour events must meet with very strict specifications which will guarantee the best organisational standards both at sea and onshore. The regattas must include; races at the closest possible range to the public, the stadiums, but also coastal races as well as dozens of miles rallies to put to the test the skippers staminas. To be quality certified, an event must, moreover, last a minimum of 5 days and should not exceed 17 days competition. « The underlying idea of this Tour it to propose great adventures similar to the Sailing Arabia The Tour at Oman. The first Diam 24 One Design champion will be announced in november, at the end of the Grand Prix Pacifique des Jeux. 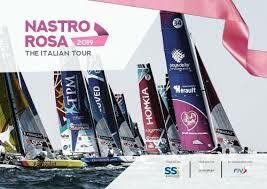 The winning team will be distinguishable from the other competitors as from 2019 by a star on its sailing gears and a golden Diam on its Main Sail. Classifications will be set in order to account for the number of participants which have signed in for each event. An acknowledgement procedure has been lately submitted to the International sailing federation (World Sailing). One of this World Tour objective is to open the organisation frame to International level and give visibility to anglo-saxons sailing crews.